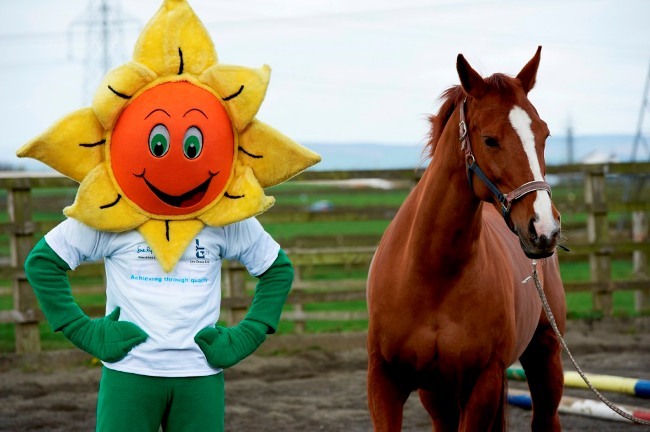 Home > Bradford > Halifax firm aims to de-throne the “neigh-ning” champion in Mascot Gold Cup! Just three weeks after a Yorkshire horse romped to victory in the Grand National for the first time in 53 years, a Calderdale recycling company is hoping to follow in its hoofprints by being first past the post in another big race with a difference – this time for mascots! Gary Kingdon is saddled with the hopes of the Swalesmoor-based Leo Group as he takes part in the world’s biggest mascot race at Wetherby Racecourse on Sunday (April 28) – screened in front of millions on TV. Dressed as Sonny the Sunflower, Gary will be helping to boost the profile – and charity funds – of event organisers Sue Ryder as he jockeys for position with more than 70 of the UK’s top mascots. Between him and victory is in a one furlong race over eight fences, staged as part of the track’s annual ‘family day’. A planning manager for the company’s pet food operations, he has spent the past month in training as part of his bid to de-throne two-times winner and “neigh-ning champ” Eddie the ‘Edgehog, from Cheshire. We donated more than £125,000 to charities and good causes last year and Sue Ryder was among those to benefit. The work of the charity touches the lives of so many people at the heart of our local community that we are supporting them again this year. Running in their Mascot Gold Cup is one way in which we are doing so, with the aim of raising money while having a bit of fun at the same time.